If you are new here, you can find all of the posts in our Overcoming Eczema, Food Allergies and Night Terrors series here to get caught up! We had a wonderful weekend here in Denver. 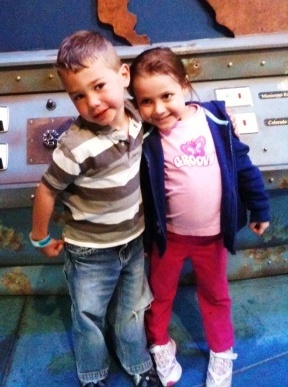 We had so much fun at the aquarium on Friday that we went back with my friend and her little boy on Saturday. On Sunday we joined our friends at their church and spent the afternoon at the Ronald McDonald House playground. I was proud because I was able to give Bella a bath and wrap (cover) her hands and feet and still get to church on time. My church family at home will never believe this! Isabella slept well all weekend. Sleep feels so good! Just before bed on Sunday night she got itchy. It was the first time since early in the week. I immediately started questioning everything and blaming myself. Is it because I let her play outside all afternoon? If that’s the case, I’m in trouble when I go home. Did I not put enough vanicream on her throughout the day? Was it the cookies I let her eat? They had milk in them. Maybe they weren’t baked long enough. Is she itchy because she didn’t have a nasal wash all weekend and she has been snotting all over herself? There are red spots on her face now obviously from snot getting smeared on her face. I should have taken her into the hospital for a nasal wash. There was no way I was going to try to do one by myself! Her bath and wraps cured her and she woke up with just a few red non-itchy spots on her face. Speaking of nasal washes, she woke up Sunday morning in tears because she knew she only had one more day until she had to get a nasal wash. It was short lived because we were going to do some fun stuff, but Monday morning was a little more difficult. I had to pretty much drag her to the car. After we had our vitals taken Monday morning, I asked the nurses to just get the nasal wash over with. After two days with her nasty cold, she really needed one and I didn’t want her to be anxious about it all day. It took two nurses and me to hold her down while the third one squirted her nose. They said they have never had a child so scared and fight it as much as her. This time it got to me and I had a hard time choking back the tears. It breaks my heart that she is so scared. We started a nose spray (nasacort) to help her out with the cold. After our bath, we challenged almond butter and she passed! Watching her try new food has been so much fun. We spent an hour with the psychologist. She is going to make sure the child life time really works with us on the nasal washes and the upper GI. We spent the afternoon challenging fish sticks. Again, she passed! While she was challenging fish sticks, one of the volunteers brought Isabella some masks and dolls to color and decorate. When they were finished making them, they gave them each a real nasal wash in the bathroom. At first, Isabella would not even hold the squirter! Finally, she came around and had some fun with it. The nurses recommended that we let her play with one in the bath tub tonight. We are scheduled for our second try at an Upper GI in the morning. One of the Child Life Specialists is going to go with us and try to get her to co-operate. She told Isabella to bring her baby doll. Please pray!! You can read all of the posts in the Overcoming Eczema, Food Allergies and Night Terrors series here. It sounds like she is making great strides! Prayers are sent your way that she has an easier time with her treatments. I crying to read these posts…as i said earlier…we are going on 6 1/2 years and I have never met another mom who really knows how it feels. So thankful that you wrote this…we are soooo looking forward to this hospital.You are a blessing. Sorry Carmen! I found the picture on Pinterest I think. I could never find the original poster to give them credit. It looks pretty fun though! If you make one send me a picture and I’ll share it with my readers.